A wild turkey, on display for the local ladies. Photo: Alan Vernon. As Thanksgiving approaches, all thoughts turn to turkeys. Especially when I see a gang of wild ones impeding my progress as I walk to my office in the Berkeley hills. These turkeys are feathered and feisty, strutting on their skinny legs and poking the ground with their sharp beaks. Wild turkeys, Meleagris gallopavo, are not native to California. They were first introduced to the state for hunting in the 1870s. Subsequent introductions, in the 1920s and 1950s, failed to take—the birds were farm-raised and they didn’t fare well. In the 1970s, California Fish and Game introduced a subspecies called Rio Grande (M. gallopavo intermedia), wild-caught from Texas. This time, the turkeys kept trotting. Fish and Game estimates that there are now 240,000 wild turkeys in California. Some think of wild turkeys as dinner—you can hunt them, if you have a license. One of my students assures me that they are delicious. However, others think of them as pests. People blame them for digging up gardens, leaving droppings, and scratching cars (especially if a turkey sees his reflection in a shiny car door). To prevent turkeys from damaging your property, California Fish and Game has some recommendations in their Keep Me Wild guide. Like the feral pig, another non-native species that was introduce for hunting, wild turkeys have important effects on our local ecosystems. 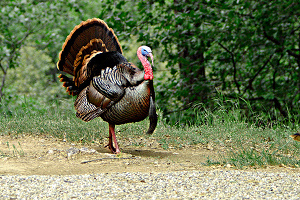 Turkeys tear up the ground in their search for tasty insects. They eat a wide variety of foods, from acorns to lizards. Daniel Gluesenkamp at the Audubon Canyon Ranch studied their ecological effects. Check out this article from Bay Nature to learn more. I used to think of turkeys as the Norman Rockwell Thanksgiving Dinner archetype: plucked, basted, and golden brown. But now that I’ve seen wild turkeys, I have much more respect for these birds. They are proud, regal, and frankly a bit intimidating. I now understand why Ben Franklin wished the Founding Fathers had chosen the turkey, rather than the bald eagle, as the nation’s bird. I was just writing up something on the wild turkey and found an article from 2001 that discusses fossil evidence that suggests Wild Turkeys or at least a predecessor of today’s wild turkey, actually were present in a small pocket of California. So the introduction of the Wild Turkey may have in-fact been a re-introduction instead. You’re absolutely right – California did at one point have a native turkey! The California Turkey, Meleagris californica, lived in what is now Southern California and New Mexico. Numerous fossils have been found in the La Brea Tar Pits, near LA. The California Turkey was a bit different from our modern turkey. It had a short, wide beak compared to modern turkeys, and its wishbone looked a little different. It went extinct about 10,000 years ago, probably because of a combination of climate change (there was less rainfall than today) and hunting by humans.